Enter your email address to receive updates on new product arrivals and to learn about special offers from WeekendKits.com! Complete Beginner Embroidery Kit from Sublime Stitching! The Ultimate Embroidery Kit from Sublime Stitching is a beginner embroidery kit with all the essentials you need to learn how to hand embroider anything! 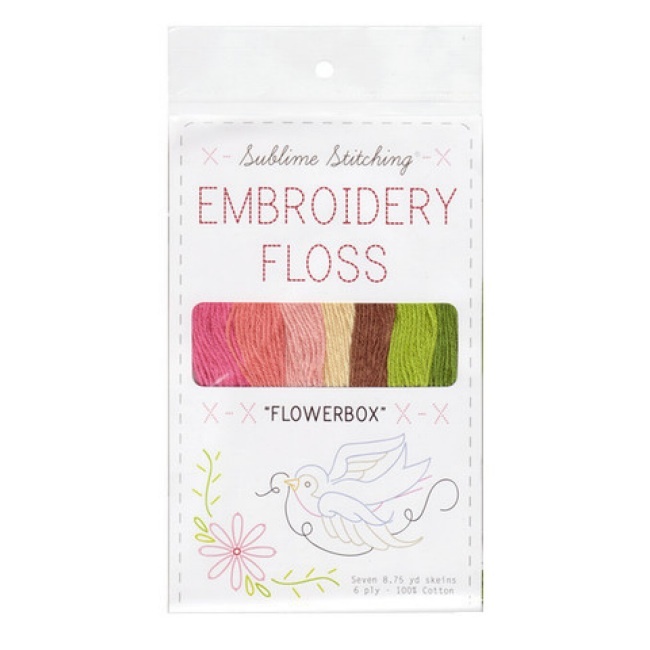 Kit includes a 100% cotton tea towel, 5" plastic embroidery hoop, embroidery needles w/magnet, 7 colors of embroidery floss, embroidery scissors w/leather sheath, embroidery how-to instructions & stitch diagrams, plus your choice of pattern pack. Choose your favorite pack of Sublime Stitching's multi-imprinting, iron-on embroidery patterns from our selection of 27 themes. Learning hand embroidery has never been easier or more fun! Items in the table below are optional add-on purchases for this kit, available for your convenience. If you would like to purchase any of these items, you can enter the desired quantities and add them to your order here. 7 Skeins of 100% Cotton Embroidery Floss. Be sure to see all 9 Sublime Floss Color Packs! Copyright © WeekendKits.com. All Rights Reserved.